I've been putting off writing this for months, because I couldn't figure out what to say. CBS's expansion of the Star Trek universe is certainly divisive, to say the least: there are those who laud its grittier aesthetic, its more adult characters, its design expansion and its storyline, while some becry a perceived departure from established lore and storytelling. There appears to be no in between. In principle I have no problem with a franchise installment which perhaps deviates from those that came before it. After all, life is change. If you'll allow me a few paragraphs to set up the comparison, Stargate Universe (2009-2011) similarly detached itself from the shackles of the SG1/Atlantis formats, introducing shaky cam, grungy sets, adult relationships and exceptionally long story arcs. Even smaller changes such as updating uniforms and leaving behind the familiar trappings of the SGC were, in themselves, enough to send some reviewers packing. Enough, in fact, that the show was unceremoniously cancelled after two seasons, in the midst of a plot that curiously resembled the show's real-life struggles (the crew of Destiny attempt to evade a relentless army of unthinking drones that they'd accidentally awoke; upon discovering that the drones were waiting for them at every turn, they gave up and went into stasis hoping that their luck would be better in the next galaxy). SGU, though, also exhibited an exceptional production quality, with game-changingly flawless CG and an utterly divine soundtrack that remains memorable to this day. The characters were all interesting and their motivations — for the most part — easy to discern, and the acting (from a mostly unknown cast) was solid. Nuanced dialog and imperfect heroes kept character moments feeling true. The overriding story arc that began to play out particularly over the second season, was genuinely interesting and even potentially inspiring. Character links with the original shows and a strong connection to the established mythos and history of the earlier installments, to my mind, left SGU as an entirely worthy addition to the Stargate franchise. Any apparent deviations even made some sense, given that Universe was set a good few years after its predecessors. That is, though I did personally prefer the new aesthetic by some margin, if Universe had not connected properly to SG-1 and Atlantis, or if it had attempted to do so but made too many mistakes along the way, I may have argued that it would have been better off as new story in its own right, unconnected to the "Stargate" name. And so we come back to Discovery. In much the same way, last year's first season took the original Star Trek brand, then both humanised and darkened it. There were no more bright sets and by-the-numbers bridge scenes, no more fixed command structure… and, actually, not even a single ship and crew to follow. The show's method of storytelling deviated considerably from earlier incarnations, introducing characters that did not seem to show any real respect for the chain of command, who attended 21st century-style parties in the would-be Ten Forward area of the ship and who dropped F-bombs during the course of their duties. The problem with this is Starfleet had already been well-established not to act that way. One might argue that Starfleet is huge and just because one crew behaves a certain way, doesn't mean others don't. But then there continuity problems more difficult to reconcile. The introduction of a foster sister to Spock (heretofore unmentioned), ready access to holodeck technology in 2257, a massive war (also new in the timeline) and the fact that the Klingons look entirely different than they had been back when some were main cast in two seven-season fan favourite franchise installments. Even the uniforms are completely different, apparently fleet-wide, than they should be at that point in the timeline (although I did notice from the Season 2 trailer that the Enterprise crew have their familiar uniform colours, so Discovery and the admiralty must both be "special" somehow and that solves that). To me, the most glaring evidence of all this, was when Sarek's inability to comprehend emotion was used as a plot point, whereas in Star Trek lore it is known that Vulcans have extreme emotion and indeed comprehend it very well (and this is why they must fail to express their emotions). That's a remarkable error for the writers to make. It may have been easier to swallow if the science made sense: for story purposes we are supposed to handwave the displacement-activated spore hub drive and space-tardigrade (both of which stretch credulity more than a little), but there is no easy way to imagine that a Klingon ship casting out a large beam of light for a few moments would be perceived "across the galaxy" as a new star in the sky practically instantaneously. Similar logic-defying feats permeate the show in a manner that's difficult to ignore. Furthermore, the graphics are disappointing and the music entirely forgettable. 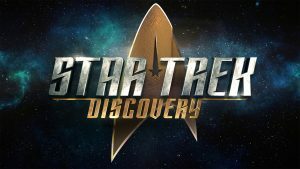 So, Discovery has its problems. The aesthetic is so vastly incompatible with that of shows such as Deep Space Nine, Voyager and Enterprise (which aired not even that long ago) and even to the more recent Abrams movies that, combined with these problems, it's hard to justify it residing in the same franchise. That's not to say that there's nothing to enjoy. I recently rewatched it for the second time, on a long pair of flights. Already aware of what I was going to dislike, I found myself enjoying it for what it was. I noticed Michael Burnham developing friendships with the crew. I noticed the galactic politics playing out with some (if not much) nuance. I appreciated the many, many references for long-time fans and the way in which the back half of the season played into a large element of the old mythos, in a fairly clever way. Unfortunately the two main character-related plot twists had already been spoiled for me the first time I watched the show, but looking at them objectively there is some solid storytelling there. 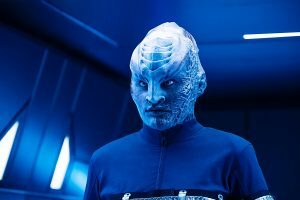 And though most of the cast chews the (well-built) scenery almost constantly, Doug Jones is particularly remarkable as Saru. In conclusion I think what I'd say about Discovery is that, if the quality of the production were higher, and the dialog better written, I'd not have equivocated so much about whether I liked the show, whenever people would ask. Ultimately there is a lot to like here, and more importantly a lot of promise; I'm still not convinced that the show currently fits into the universe it's intended to inhabit, but with some tightening up of the timeline the show could yet win over uncertain Star Trek fans.